Jellyfish are not fish, but are actually Cnidarians or sea jellies. They are invertebrate animals, which means they do not have a backbone. Large adult sea jellies are often accompanied by small fish which hide amongst their tentacles for protection. All sea jellies have stinging tentacles but the stings vary from severe to a mild and temporary prickling or burning sensation. For humans, sea jellies are among the most dangerous animals in the sea. Box jelly and irukandji are capable of inflicting serious and even fatal stings. Sea jellies are most recognised because of their jelly like appearance and this is where they get their name. They are also recognised for their bell-like shape and tentacles. Sea jelly species vary in size, some reaching two metres across the bell and trailing tentacles 30 metres behind them. Some have bodies that are so clear you can see right through them. Some sea jelly have a thick fluffy-looking frill between the upper bell and the lower tentacles, which actually contain countless mouths to trap small organisms from surrounding waters. The upside-down sea jelly betrays its close relationship with the anemones by attaching itself, tentacles up, to sandy and muddy bottoms, often in the vicinity of mangroves. 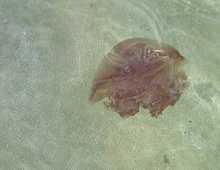 Like so many other cnidarians, sea jelly have zooxanthellae in their tissue. Plastic bag or sea jelly? them to feed the chicks. Sea jelly drift at the mercy of the currents, often accumulating in sheltered bays and estuaries. They swim in an unusual way - a pumping action where muscles in their bodies contract and propel them through the water. This does little more than allow them to move up or down in the water. However, the four sided box jelly are powerful swimmers with good control and speed. Sea jelly reproduction is often complex involving two different body forms - the attached polyp and the free-swimming sea jelly-like medusa stage. Like most other Cnidarians, sea jelly have a two-part life-cycle. The first stage is the familiar free-swimming bell-like stage. The polyp is the lessor known stage, which forms just after egg and sperm combine. The polyp stage is normally very small and not free-swimming. Prior to summer the polyp starts to shed parts of its body, each of which grow to form the swimming sea jelly stage. The sea jelly is made up of 95% water. A group of jellies is called a smack. Depending on the number and length of tentacles, sea jelly feed in various ways. Most catch their food with their tentacles as it drifts by and is then carried to the mouth, which is located in the centre of the bell shaped body. Some sea jelly eat small crustaceans and fish, some eat minute planktonic organisms. Often called the sea wasp or marine stinger, the box sea jelly is the most dangerous marine animal to humans. It inhabits the shallow coastal waters around northern Australia and can be found in the waters of the Great Barrier Reef during the summer months between October and April. The body or bell, which is box-like in shape, can vary in size from 5-25 centimetres across and has groups of tentacles (up to 15) at each of the four corners. In an adult the average length of tentacles is about three metres. Box jellies move in the water by filling their bell with water and then forcing it out again and they can travel at about two knots (as fast as your normal walk). Their tentacles, which are covered in millions of stinging cells or nematocysts, drag along behind them as they move. The box jelly does not actively hunt but relies on food to bump into it. This is how humans are usually stung when swimming or wading in the ocean. The box jelly are difficult to see as they are almost invisible in the water. When an animal (or human) comes into contact with the tentacles the stinging cells are triggered and fine, hollow threads pierce the victim allowing the venom (poison) to enter. The tentacles attach to the victim with the help of a sticky material produced at the same time. The irukandji sea jelly is also one of the most dangerous marine animals found in the Great Barrier Reef. The irukandji is a tiny sea jelly with a two centimetre wide bell and tentacles from five to fifty centimetres long. They are clear and extremely hard to see in the water. An irukandji sting can cause extreme sickness and can even be fatal. Stings have been recorded along various parts of the Queensland coast within the Great Barrier Reef Marine Park, including in the Mackay/ Whitsunday region. Swimming in the ocean between the warmer months of October and May is not recommended without protective clothing such as a stinger suit. Care should be taken when swimming in stinger enclosures, as the irukandji is so small it can sometimes fit.